1. Wash and slice vegetables into very thin slices. 2. In a large bowl, mix vegetables and add about 1/2 teaspoon of sea salt per cup of chopped vegetables. 3. Mix gently by hand. place a small plate that fits inside the bowl, adding a weight on top of the plate. longer, leafy vegetables take less time) or until water is expelled from the vegetables. 6. If the vegetables taste too salty, quickly rinse under water. 7. Serve plain, with lemon juice, rice vinegar, or umeboshi vinegar. 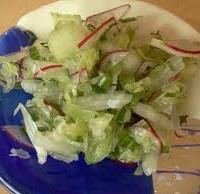 • Nice pressed salads include: mustard greens or radish greens, chopped finely and pressed for 30 minutes; cabbage leaves, finely chopped, layered with sea salt, and pressed for 30 min­utes; carrots, grated, shredded, or cut into matchsticks, pressed for 30 minutes. • Ingredients may be pressed longer, up to a couple of days, to make light pickles. • Brown rice vinegar, umeboshi vinegar, or shoyu may be used for variety in the press­ing instead of salt. 1. Bring about 2 to 3 inches of water to boil in a cooking pot. 2. Wash, clean and drain watercress. 3. Place 1 bunch of watercress in the pot of rapidly boiling water. 4. 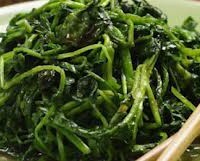 Cook about 5 to 7 minutes until watercress is tender but still bright green. 5. Remove from water, drain and allow to cool. Cook the second bunch of watercress. 6. Squeeze out some of the extra water from the cooked watercress. 7. 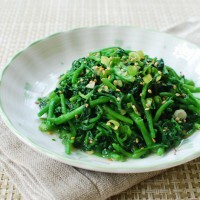 Cut in 1/2 inch pieces and toss with the chopped shiso and half of the sesame seeds. 8. Arrange in a mound on a serving dish. Garnish with the remaining chopped, toasted sesame seeds and the pieces of nori. Eat immediately. 1. 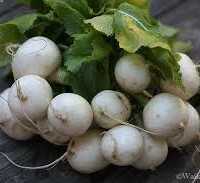 Place turnips in a saucepan, adding about 1/2″ water to the bottom of the pot. 2. Cover with a lid. 3. Bring to a high boil, and then reduce flame to a medium low. 4. Cook for 5 to 10 minutes or until just tender. 4. Snap off stem end of each snow pea and remove “strings”. 5. Dilute miso in a little water and spoon over the top of the turnips. 6. Place snow peas on top of turnips. just until they turn bright green, but are still a little crunchy. Remove the lid. watercress in the boiling water. After the water returns to a boil, continue boiling for about 3-4 minutes.